Last week Delta denied me my high fructose corn syrup laden peanut butter crackers. Sadness. But this past weekend, I flew Midwest Airlines for the very first time. 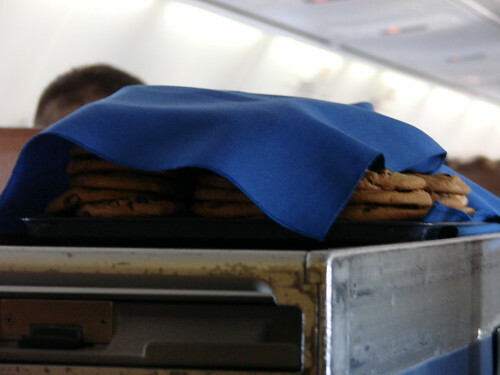 Can you say complimentary chocolate chip cookies baked in flight...? Ever since Blondie hit up Vegas last summer she's been talking up Midwest Airlines. Their comfy seats. Their friendly staff. Their fresh baked cookies. Hold it. Roll that back. Fresh baked cookies?! Now you have my attention. 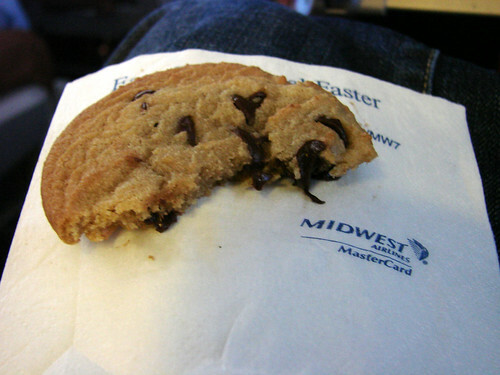 Yes, indeed, Midwest serves up fresh warm chocolate chip cookies baked on board on most flights. And not just one cookie but two! Alas, my first flight out to Milwaukee last weekend departing LaGuardia at 7:10am was too early for cookies. 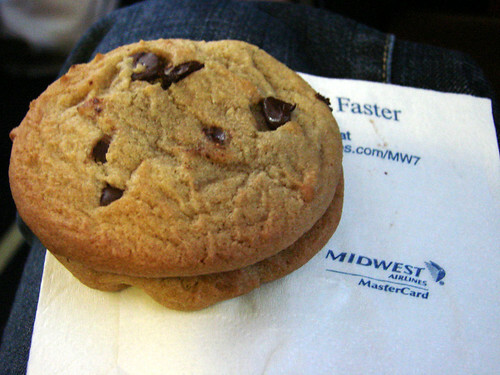 (Note to Midwest Airline CEO: It is NEVER too early for cookies. Cookies are an important part of a healthy breakfast). Then my connecting flight to Madison was too short for cookies--we literally took off and 5 minutes later we were beginning our descent. Would I never get to try these elusive chocolate chippers? Sunday afternoon I was finally rewarded on my way back to the city when I awoke from my nap to the sound of the cookie cart barreling down the aisle toward me. Hooray! Frozen cookies for purchase are available at the "Best Care Club" by Gate 38. You don't need to be a "Best Care Club" member to purchase the cookies. Glad they haven't cut back the fresh cookies. Midwest is awesome! OMG. I now have a reason to go to Milwaukee! It seems like there might be some kindred cookie spirits in their marketing department or Harry Potter fans that are trying to recreate the Hogwarts Express. I so want to fly now! Fresh cookies are a good reason to do just about anything! I chose a hotel once based on the fact that Doubletree gives fresh cookies at check-in. Totally worth it! how did i never know this before?! i need to start flying midwest. 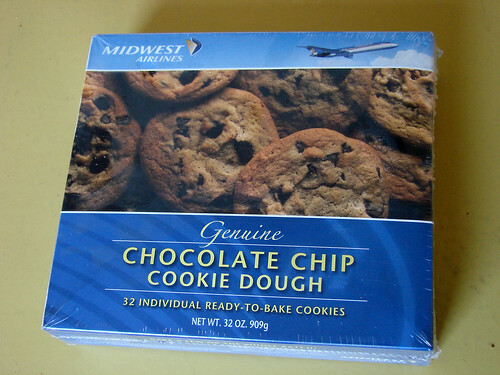 cookies definitely seal the deal - i'll choose chocolate chips over direct flights any day. No, Not You Too, Batch!! Farewell My Tangy Stinky Roquefort!! Remember to Eat Your Mac and Cheese!!! Are Blondies the Opposite of Brownies? An Off-the-Radar Macaroni and Cheese Contest!! Very Important Pizza, in My Hood?